This Government is responsible for a raft of ill-informed, counter-productive and frankly dangerous policies. Take your pick from a growing list that includes austerity for the many and tax cuts for the wealthy, plans for aircraft carriers without any aircraft, levying a tax on hot pasties, encouraging people to store petrol at home, privatising the NHS and reducing charities’ income. In local government, its latest wheeze is to ignore the really big problems affecting cities like Manchester, such as growing unemployment, especially amongst our young people, at the same time as it continues its massive and damaging onslaught on public services. London and the South East continue to enjoy the lions’ share of Government resourcing, with economic policy being dictated by London bankers to meet the requirements of the finance sector who caused so much damage. Yet instead of dealing with the real problems, the Tory led Government is forcing cities like Manchester to waste money on a referendum on whether to have an elected mayor. We have always had a Lord Mayor, chosen by the elected and accountable Council, who represents the City in a non-party political role which has been good for Manchester. However, an elected mayor will be bad for Manchester and bad for local democracy. Power is concentrated into the hands of just one individual, creating a politics of personality, not of substance. The role of local ward councillors would be diminished, reducing their ability to influence things in light of their community’s views, as an elected mayor will take all the decisions without much need to consult councillors. 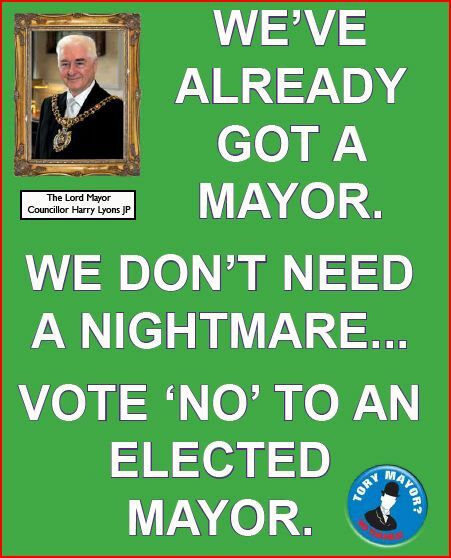 Once elected they can do what they want for years and can only be challenged by a two thirds majority of the Council. It’s less democratic than the current system and could easily lead to corruption. An elected mayor will not get any additional powers or resources. What is proposed is nothing like the London Mayor and Assembly model, where the London Mayor has real power over transport, planning and development across London. Manchester does not need an elected mayor. It would be an unnecessary cost to residents, would concentrate power in one person and completely undermines democracy and accountability. This referendum matters. Referenda for an elected mayor have been agreed in some areas where there was a very poor turnout. If you have a vote in the Manchester referendum, please use it. Defend our city and reject this Government con trick. Vote for the leader option.